I'm assuming the 35kwh is the right answer here, but it's certainly up for debate. Coming from the LEAF world, it's reasonable to assume the normal charge is 80%, but I don't think Toyota has given any indication that it's supposed to be an 80% charge. Then there is battery capacity degradation over time as an influencing factor to be considered. I have only owned my car for the last 10 months. It has only been driven about 5000 miles, so I do not consider any cummulative battery degradation as yet very significant. However, RavCharge should probably still allow for degradation with some sort of time based multiplier to determine what corresponds to a 100% (normal) charge status. For example, -3% per year, or -0.1% per 500 miles, could be applied. Thanks for the compliment. I feel like I've still got a ways to go to make sure I've ironed out all the bugs and added in a few more useful features before I'll declare victory, but I'm glad that it's mostly working out great so far! I just logged on and tried out RavCharge. Nice. Entunes is really a big disappointment. If only there was a way to extract more information. Particularly, it would be nice to be able to create a driving log: miles driven, kwh used, time elapsed, etc. Similarly, it would be nice to be able to create a charge log. Would you be interested in help for possible mobile app development? ..--- ----- .---- ..--- / .-. .- ...- ....- / . ...- / -... .-.. .. --.. --.. .- .-. -.. / .--. . .- .-. .-.. The EPA decided for you! They average 80% and 100% charges on only two cars; the Nissan LEAF and the Toyota Rav4 EV. Plus, I have actually driven the car down to turtle and arrived with 80% burned of 41.8kWh. Unfortunately, I can't do that anymore with 6.5% loss. Here's a thought, can RavCharge incorporate data from Entune's ECO Dashboard regarding EV Efficiency? This history data in the ECO Dashboard is essential a tally of "running averages" of each EV's driving efficiency in miles/kWh from month to month and day to day. The latest update in the ECO Dashboard seems to correspond to the "learned" efficiency up to a particular point in time on a daily basis. Perhaps this should be the basis for a "default" in Ravcharge, either as a preset by the program or selectable by the end user if it can be displayed as a reference on the status screen. I realize even this "number" is hard to understand how it was actually determined; some sort of "secret" that only Toyota (or Tesla) knows. However, it does seem to take into account "driving styles" and other real world factors that influence driving range in terms of miles per kWh. Early on I aimed to pull data from the ECO Dashboard area as well as the main status/charge/climate areas, but for whatever reason I couldn't get it to work. It seems that stuff uses a different system. I intend to revisit that at some point, but I've got a lot of other stuff on my list already! Just logged in on my iPad - looks great, worked flawlessly getting in, can't wait to understand how it all works. I'll read about it tomorrow. Thanks very much for the effort!! I have some ideas about the log-type features, but I think it would be pretty limited in accuracy with the information available through entune. It is a mobile app! I just prefer the website approach over developing and maintaining separate iOS, Android, yada-yada-yada versions of the same thing, but maybe once things have settled down a bit I'll consider that. By the way, to really get the "app-like" experience, at least on an iPhone or iPad, navigate Safari to the site, login with 'remember me' checked, then touch the little forward arrow / rectangle thing at the bottom and choose 'Add to Home Screen". Then you'll get a nice little app icon on your springboard that you can touch to bring you straight to RavCharge, plus it will open the page in full-screen mode, without any pesky address bar at the top or navigation bar at the bottom. My graphic design team (aka wife) just made us some fancy new graphics, including the springboard app icon, favicon, and logo in the header bar. Also in the header bar there's a new menu button in place of the logout button, and the menu now has the logout button and will eventually have a 'settings' area that can be used to set options like battery capacity degradation, time zone, and so on. TERRIFIC!!! Love the new icon! Please make RavCharge check to see if the car is "Unplugged" first before sending any preset charge commands. This should prevent nuisance Entunes email notifications from being sent that say "Failure to charge . . . due to not plugged in", when leaving the car unplugged was intentional. When unplugged, and scheduled charges are still set inside the car, Entunes does not normally send such messages. It just skips the scheduled charges and assumes the owner left the car unplugged intentionally. I think RavCharge should behave the same way for its scheduled charges when the Timer is left ON. Of course, "Charge Now" manual charging is a different story! 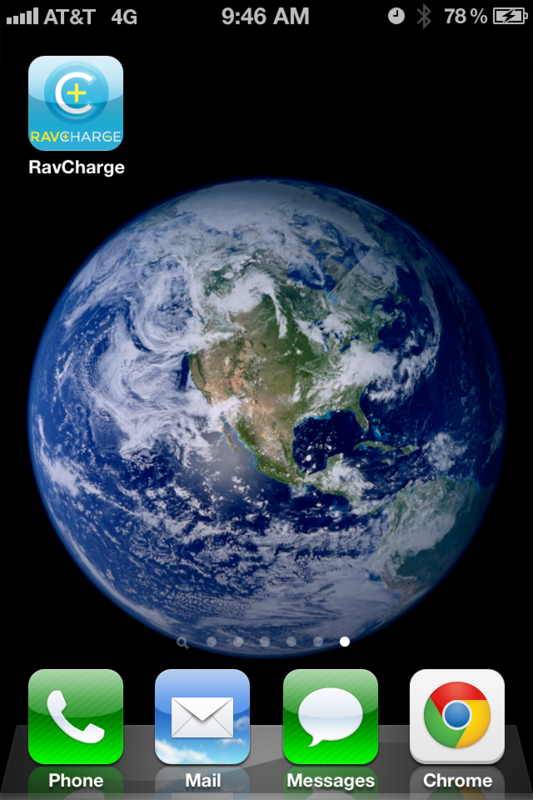 My RavCharge Timer schedule consists of a setting to initiate charging very early Saturday and Sunday mornings starting at 12:01am, which is when I would normally want automated charges to occur while the car is parked overnight. I also have the departure time set inside the car to end at 08:50am on the same days of the week (or 6:50am on week days). This is so that active bulk charge completion (known to Entunes), plus the additional idle period for so-called cell balancing and top off charging (unknown to Entunes) will complete by 9:00am (or 7:00am on weekdays). I have found that this sequence of scheduled charging events in the RAV4 EV's overall charging process, generally provides sufficient time for all sequential events (including cell balancing) to occur within these time parameters. Thus, resulting in final completion of everything in that process precisely at 8:57am (or 6:57am on weekdays). I don't know why the last 27 minutes is the fixed amount of time required to complete post bulk charging for cell balancing purposes, but that is positively what actually happens. I love the App-Like setup on iOS. The new efficiency slider to calculate range is a huge improvement over the 2/3/4 mi/kWh at launch. Keep up the great work. Great suggestion, and this has occurred to me as well, but I have some trepidation about doing this. I've noticed (with my car at least) that the car does not always report its plugged in status - possibly depending on how long of a time span there is between when you park and when you plug in - so there's a risk of skipped charges if we rely on that. Of course I could have RavCharge send a status update command some time before a scheduled charge, but that would complicate things, and status updates aren't 100%. I don't know about you, but I'd rather suffer a bit of extra entune spam rather than risk a charge not happening because the car didn't report that it was plugged in. But it's something that I still plan to explore.